While negotiators here in Lima enter their last two days of talks, Indonesia says it will be ready to begin receiving results-based payments for REDD+ by 2016. In a wide-ranging talk delivered late last night, the head of the country’s REDD+ Agency said it had not only finished its reference levels, but had implemented institutional reforms that would make REDD+ a reality. 11 December 2014 | LIMA | Peru | After announcing his country’s reference levels for forests and deforestation earlier this week, Heru Prasetyo, head of Indonesia’s REDD+ Agency, BP REDD+ (Badan Pengelola REDD+), said their system is advanced enough to begin measuring performance for results-based REDD+ payments by the end of 2016. He recapped in detail the successful implementation of programs that he outlined in an interview earlier, and expressed confidence that the reference levels submitted to the United Nations Framework Convention on Climate Change (UNFCCC) will be approved. He added, however, that the reference levels do not include carbon pools that have less certainty, and he stressed that more data would be forthcoming as the certainty surrounding those pools increases. 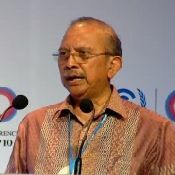 The actual reference level documents won’t be posted online after the climate talks end, but Nur Masripatin, the Deputy of Governance and Institutional Relations for BP REDD+, said they would include both deforestation and degradation, taking into account development policies in the future, and will include all forests that were still standing in 2000, including carbon-rich peatland forests. She said the country at one time had up to 14.9 million hectares of peatland forest, but the calculation includes just 8 million because of certainty reason on data availability and its associated emission estimates for the rest that had been deforested prior to 2000. The submission, and Prasetyo’s vow, cap a massive undertaking that required pulling disparate data from several sources and making sure it was consistent across the country. Prasetyo says he’s confident the country can now follow up with emission-reductions, in part because BP REDD+ has worked with authorities at all levels of government. Prasetyo says he’s confident the country can now follow up with emission-reductions, in part because BP REDD+ has worked with all levels of government. That protocol currently covers 59 districts in 11 forested provinces, ensuring that all participants will be “an orchestra that will sing together at the village, district provincial, and national level.